Rose gold coloured elegance. Jet black romance. A champagne shimmer and the promise of midnight. Chic sophistication with a cheeky side glance. Quartz. 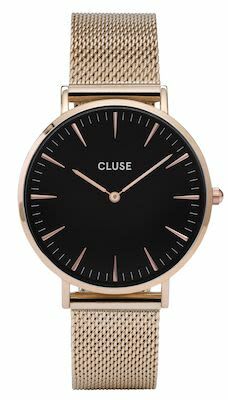 Gold stainless steel case. Gold mesh bracelet. Black Dial. Water resistant up to 3 ATM. 38 mm case.